Yes, it’s time for my favorite blog again where everyone gets to share their gorgeous doll clothes that they have been busy sewing. 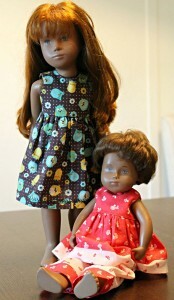 This is very clever Peggy, I love the way you experiment and add your own special touches to my doll clothes patterns. I featured Lauri in my last blog and she has been busy adjusting more of my patterns. I must say Lauri, you have done a fantastic job. I can’t wait to see what you make next. 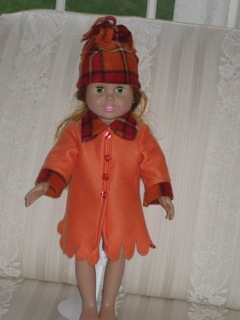 Chris has used my Fur Trimmed Jacket pattern to make her Australian Girl doll, Belle, this stunning jacket. She looks like a movie star in it and to think that the pink fur is from a cushion cover! 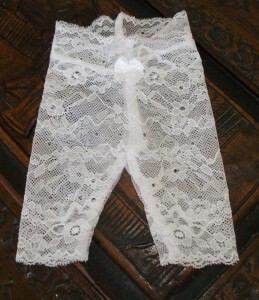 Thanks Lynne for sending in the photo, the lace leggings look really pretty. Sounds like it was quite a challenge working out how to cut them out. When I use garments that are already made, I cut carefully along close to the seam and this saves me a lot of unpicking (unless of course you need the extra fabric that is in the seam allowance). Denise has made this beautiful wedding or Confirmation dress from the summer dress pattern and both her grandkids wanted one! No wonder they both wanted one, teddy looks absolutely gorgeous! 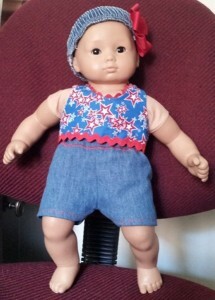 Another Laurie has been busy sewing for her Bitty Baby doll. She wrote, “I have been watching your videos for a few weeks now. I finally made one of your outfits today. Here is a picture of the Crop Top and Shorts. I used an old pair of jeans for the shorts and some 4th of July fabric for the top. They fit the Bitty Baby, but next time I’ll make the top just a little wider. I cut the front neck a little lower so I could add the trim. Very fun! Even though I have sewn for a long time, your lessons have taught me some great things and reminded me of the importance of measuring and measuring again! My pleasure Laurie, you’ve done a terrific job and it’s great to see that Bitty Baby was able to join in the 4th of July celebrations too. Thanks to everyone for sending in these great photos. It’s awesome to see so many of you experimenting with my doll clothes patterns and putting your own personal touches to them. Till next time. 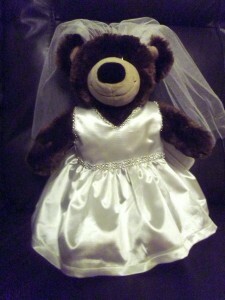 I Really like the bride bear dress! it is soo cute!! thanks for posting such great photos! I can’t believe how much the Australian Girl looks like someone we know. What do you think Rosie? I certainly needed the seam allowance in those lace tights Rosie, worth the unpicking. Parts of the lace undies were cut on the cross, a little manouvering of the pattern. Thank you for sharing my first Rosie outfit. I’m just about to review the video on gathering as I am making a gathered skirt for the first time in ages. Love the CDs and having them right at hand while sewing! 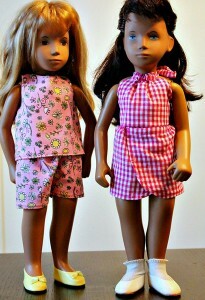 These other outfits are adorable, I am especially fond of the pajamas and the great use of trim! The creativity of these clothes never ceases to amaze me. Well done to all of you. Gorgeous photos. Lots of clever, creative people. Thank you for giving me some great ideas.